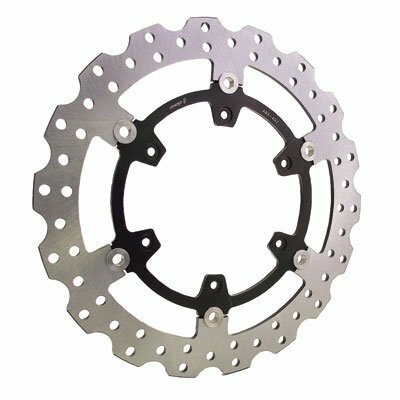 Warp 9 Oversized Floating Brake Rotor Kit, Front 320mm - Fits: Kawasaki KLR650 2008-2018. Warp 9's High performance Floating Rotors are designed for the ultimate in brake performance. The rotors are laser-cut out of high-carbon content 410 stainless steel, lap cross hatch ground, and then heat-treated. Floating rotors are mounted on a floating black steel carrier for durability and strength. The floating pins are an oversized CNC machined stainless rivet with stainless wave washer to ensure these rivets will not crush like more traditionally used steel pressed rivets. High temp enamel is applied to the surfaces of the cooling holes and edges to provide a clean finished look. Brackets are CNC milled for exacting tolerances, and made from strong and lightweight 7075T6 aluminum. If you have any questions about this product by Warp 9, contact us by completing and submitting the form below. If you are looking for a specif part number, please include it with your message.